My name is Castiel, but feel free to call me Cas. I live in North Eastern Vermont with my three dogs and a cat. And my family of course . I've been looking at the Tamaskan breed for a few years now and I feel like they're the perfect breed for me in the future, so I'm trying to do as much research on them as possible before I'm in a position to get one. I'm also interested in breeding them, however that is a LONG way off as I have a lot of learning left to do. Dixie the beagle who is 10. 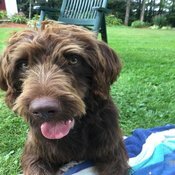 And Nico the Labradoodle who is 7 months. He is also my service dog in training. I'm so excited to learn from you all! Service Dog handler and future Tamaskan owner. My Service Dog has his own Instagram! https://www.instagram.com/death.pup.service.work/!